With emoji’s and stickers, you can make your texting interesting. Most of the instant messaging apps come with support to smileys but that is not enough. So, there are lots of Emoji apps to try. These emoji apps give you lots of different stickers and Emojis to try in your conversion. Few even offer you to create personalized Emoji. 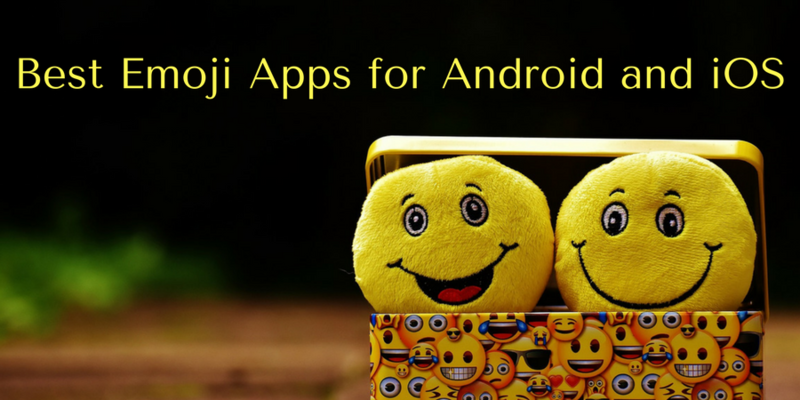 In this article, I have curated few best Emoji apps. KeyMoji is a nice app to get interesting Emojis. It brings emojis by crowdsourcing and updates its database in real-time. So, you will surely enjoy getting new Emojis daily. If you love using Emojis in your conversations, you will love this app. KeyMoji is only available for iOS and supports devices running iOS 8.0 or higher. The app is free to download. Emoji Free is another nice app that brings so many emoji options for you. You can try a wide range of emojis in your conversations. Not just normal static emoji, you also get animated GIFs to try. There are also cool emoji fonts to try. The app is only for iOS users and supports iOS 7.0 or higher. It is available for free. Emoji keyboard is a good keyboard app with built-in support for EMojis. It brings lots of EMojis, icons and animated GIFs. It also has emoji prediction with emoji dictionary. It is really a nice feature and saves your time. You can try these Emoji’s on several instant messaging apps including Kik, Facebook, Messenger, Snapchat, Instagram, WhatsApp, and more. It brings 100+ fancy keyboard themes to give you good keyboard experience. It also supports glide typing and more than 60 different languages. This app is for Android devices and is available for free. SMS Rage Faces is another nice app that brings popular face memes for you. It comes with a large collection having over 2500 faces. You have easy option to share these faces via Facebook, Twitter, and more. You can also save these faces in your phone to try it anywhere you want. What do you do to find a perfect emoji to try. If you do not want to spend time in searching for a perfect Emoji, this keyboard app is for you. It predicts best possible Emoji for you as you type. So, you do not need to go and search manually. This keyboard app works fine on different apps including WhatsApp, Facebook, Twitter, etc. It supports iOS devices running iOS 8.1 or higher. Swiftmoji is the keyboard app from the creators of popular keyboard app Swiftkey. This is a basic keyboard app similar to Gboard but it recommends emoji based on your typing. You can also search through emoji using keywords. Sticker Market is another nice Emoji Keyboard app. It is available for both Android and iOS. Not just regular Emojis, it also brings personalized stickers to use in your conversations. Not just regular Stickers, it also brings animated GIFs to try. There are lots of other popular keyboard apps with built-in support for Stickers and GIFs. Standalone apps for Stickers and Emojis are also available. But, try these 7 best Emoji apps before anyone else. If you know any other good Emoji app, you can comment below and let us know.